Within the framework of simulations and digitalization, The Simulatorzentrum KSG / Gfs invited Andreas Ocklenburg to the 2nd. European Simulator Users Conference on March 14th-15th. in the Simulator Center of KSG / Gfs, in Essen, Germany. This two day Conference gave the participants a broader overview of new trends in the simulation industry and the latest technology from GSE Systems. The Conference focused on the binomial digitalization and simulation, and how both can help your industry to become a digitalized one. New possibilities for training, maintenance, and plant optimization were shown in this 2-day event. 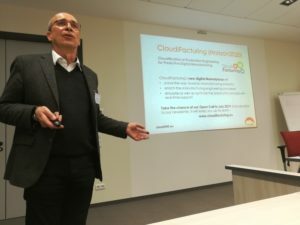 Andreas Ocklenburg, CEO and co-founder cloudSME, presented the second Open Call and showed how interested parties can participate. Additionally, he explained how the cloud portal by cloudSME works and simplifies the software-, and user management as well as the automated cost tracking and invoicing. It was one successful participation, bringing together simulators users, managers, engineers, and other participants, waking up interest among them in the technologies of CloudiFacturing.